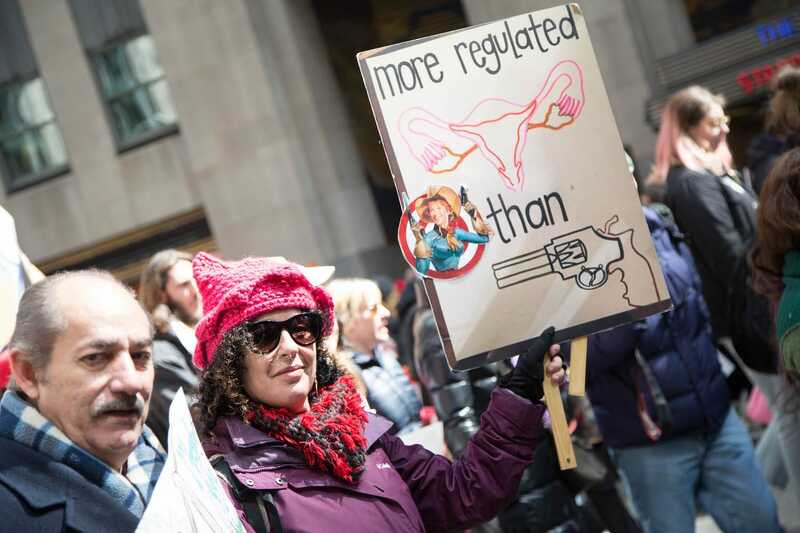 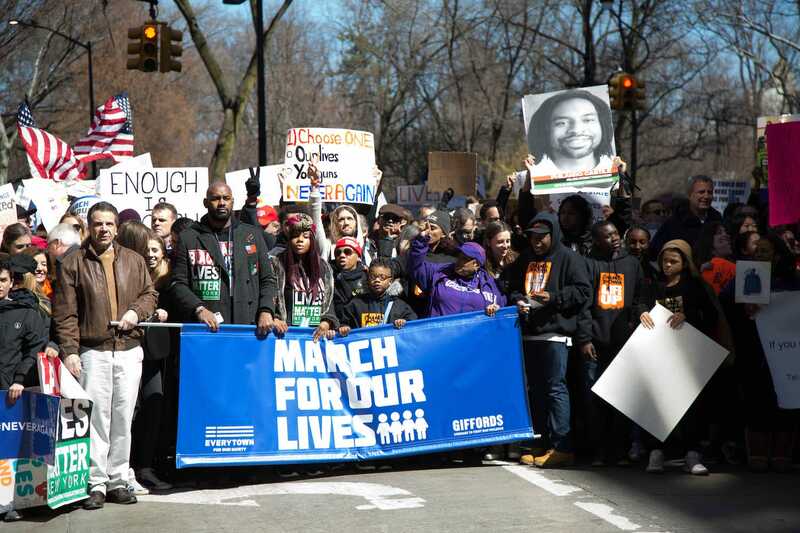 Hundreds of thousands of people took to the streets across the US and around the world on Saturday to push for gun reform in the wake of the deadly high-school shooting in Parkland, Florida. 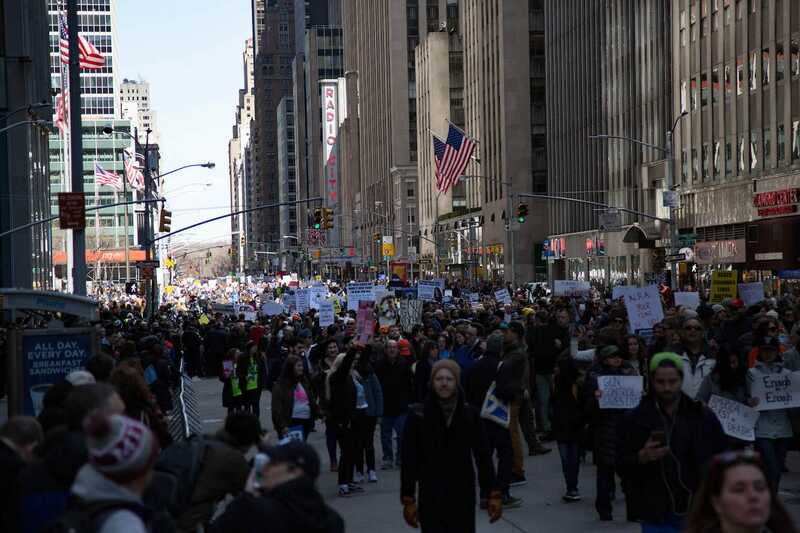 New York City was no different, where tens of thousands of people marched from West 72nd Street to Times Square, creating a line 20 blocks long. 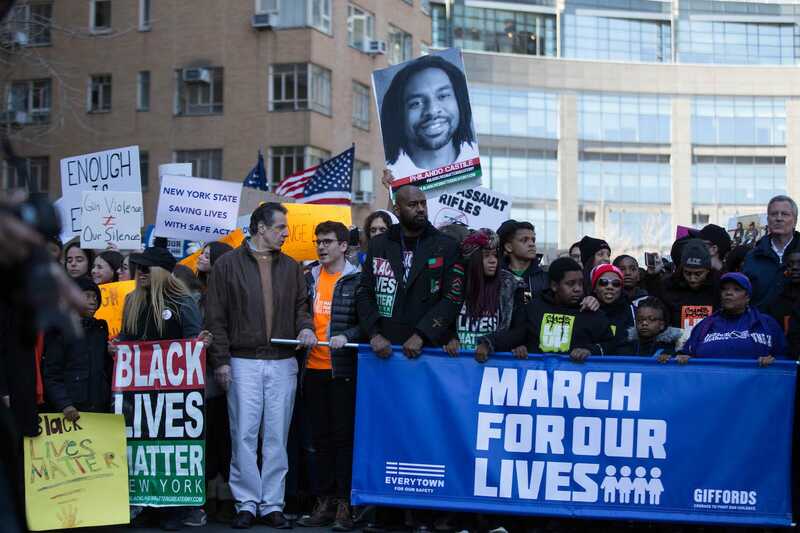 Leading the way was Governor Andrew Cuomo and New York City Mayor Bill de Blasio – but the two didn’t march together and were not once seen talking to each other. 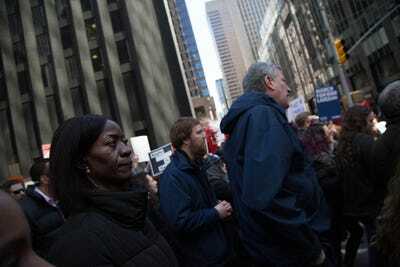 Still, the diverse group of protesters marched and stood together in a common cause. 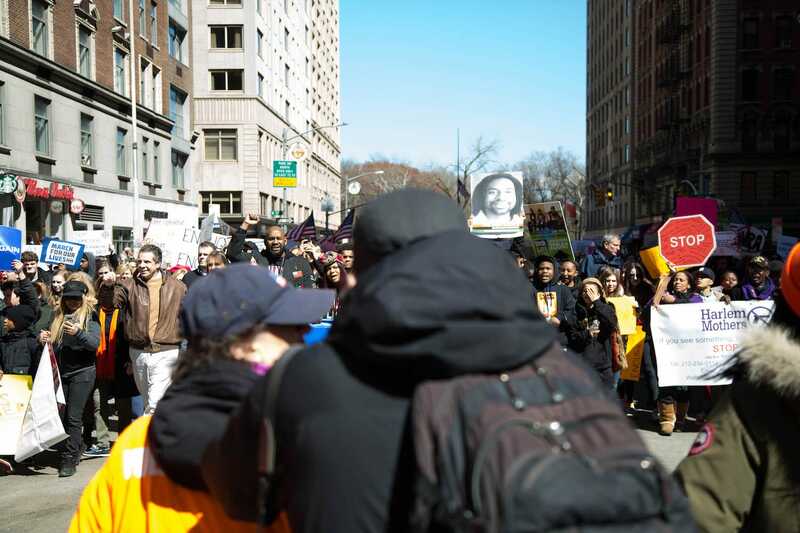 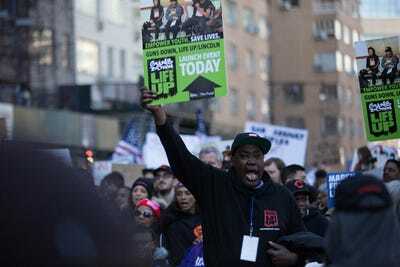 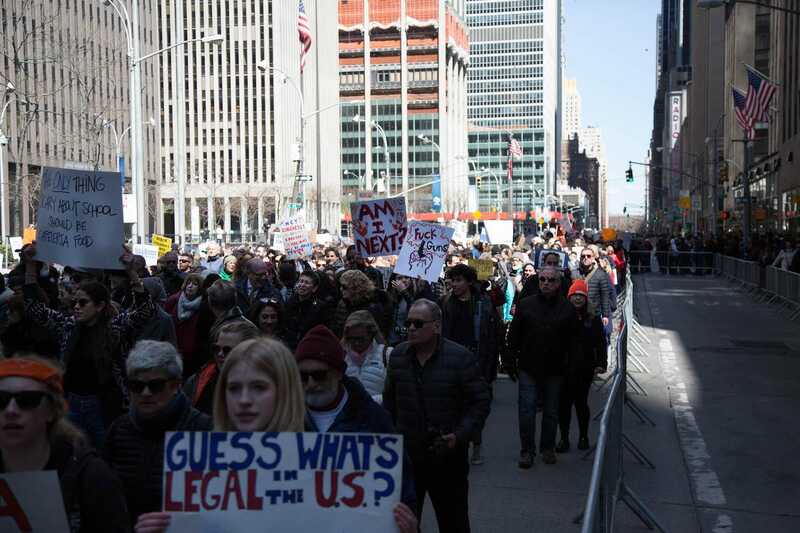 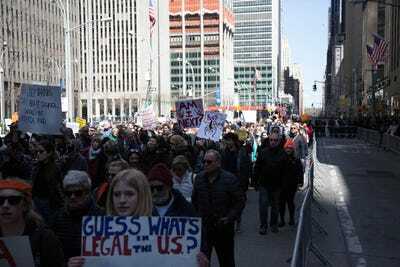 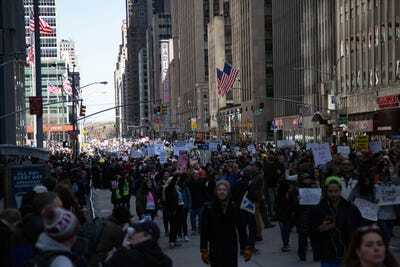 An estimated 175,000 people marched from West 72nd Street to Times Square. The marchers stretched for 20 blocks. 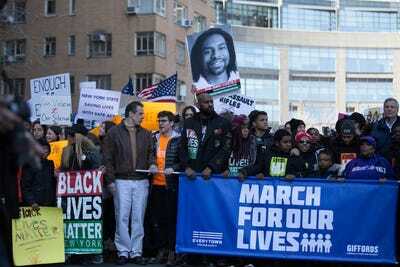 Governor Andrew Cuomo (left) and NYC Mayor Bill de Blasio (far right) helped lead the way. 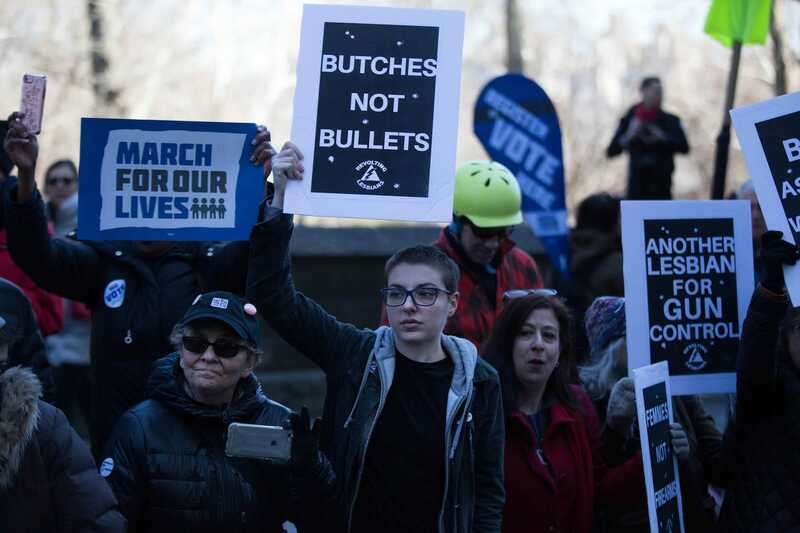 But we didn’t see them march together. 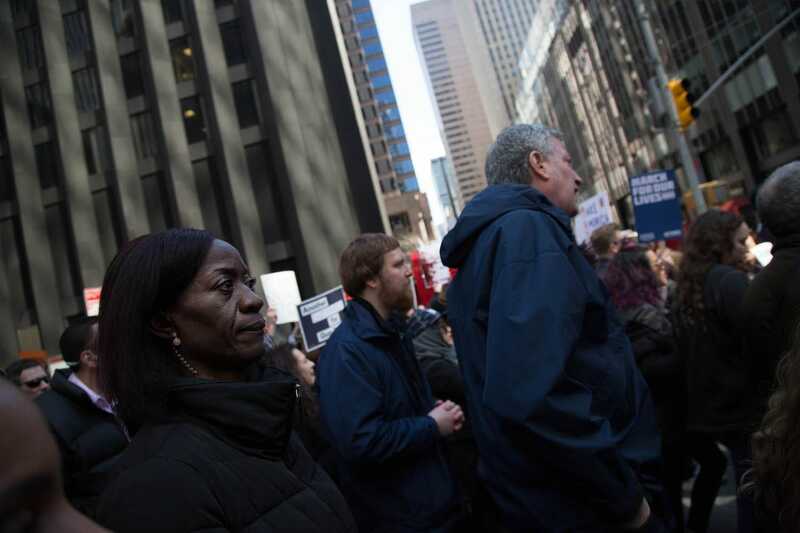 The mayor and governor have famously disliked one another for a long time, for a variety of reasons. 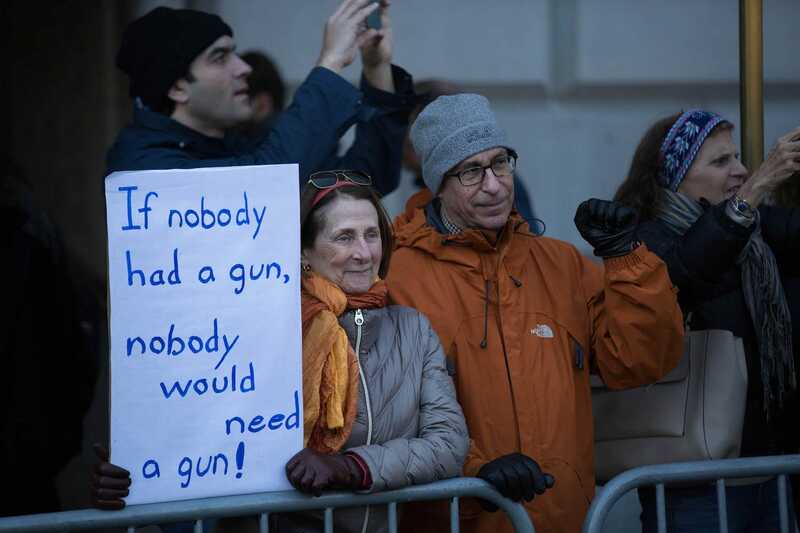 This man led the way too, often seen chanting “Guns kill people!” The crowd also chanted slogans like “NRA, sashay away” and “vote them out,” referring to politicians who have failed to act on gun-control measures. And of course, the signs abounded. 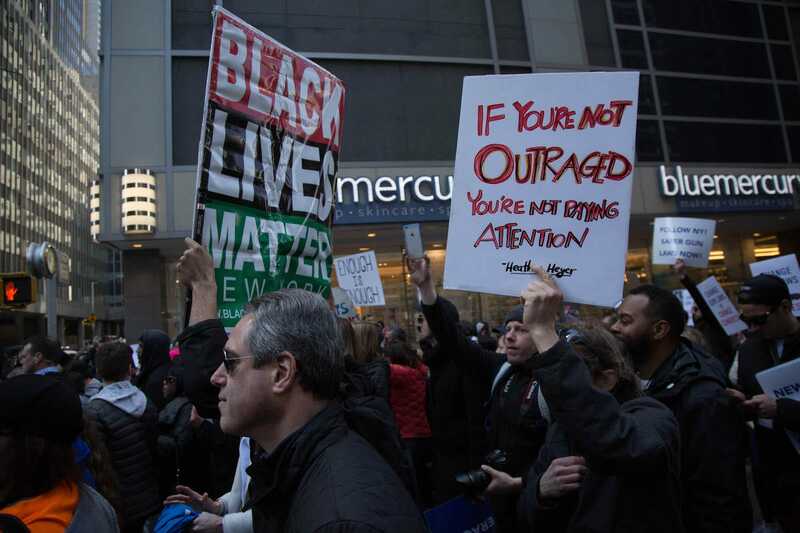 And they were all fed up with the status quo. Supporters also lined the streets, cordoned off by metal barricades. 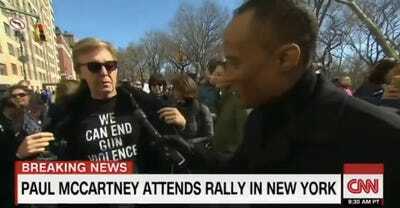 Though the crowd was so large that Business Insider didn’t spot him, Paul McCartney was present too, marching to honour John Lennon. 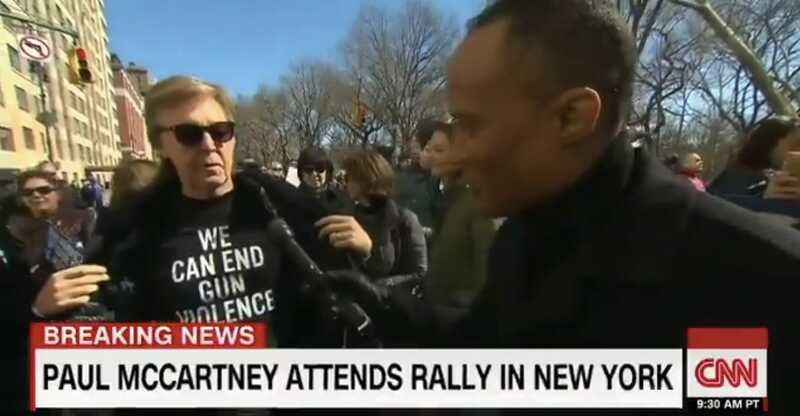 “One of my best friends was killed in gun violence right around here,” he told CNN. 34-year-old Alex Monroe, who’s lost three family members to gun violence, was among the marchers as well. “Today I’m wearing the survivor button to honour my loved ones who were taken by gun violence,” Monroe told Business Insider. 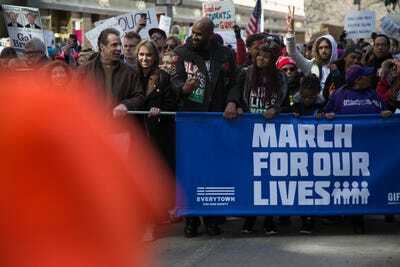 “My cousin Xavier, who was only 25, [was] shot and killed while having fun with friends at a bar in Mississippi – caught in the crossfire, died a few days before his daughter’s second birthday,” Monroe said. 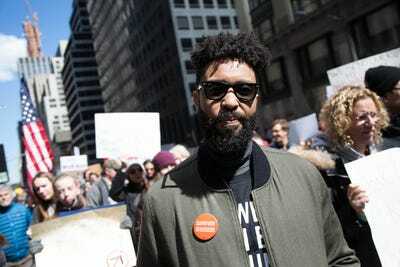 “My Uncle Brian Monroe, who was shot and killed on his front lawn in Warner Robins, Georgia in 2003 … and my grandfather, who I never knew, but was the first black police officer in Wiggins, Mississippi, and was shot in 1969 while answering a domestic violence call, leaving my grandmother to raise 9 children alone,” Monroe said. 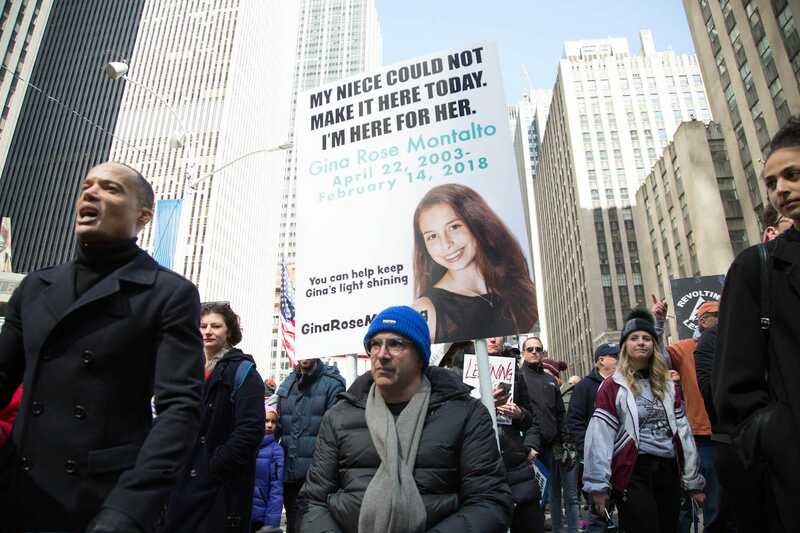 The uncle of one of the Parkland victims, Gina Rose Montalto, was marching as well. 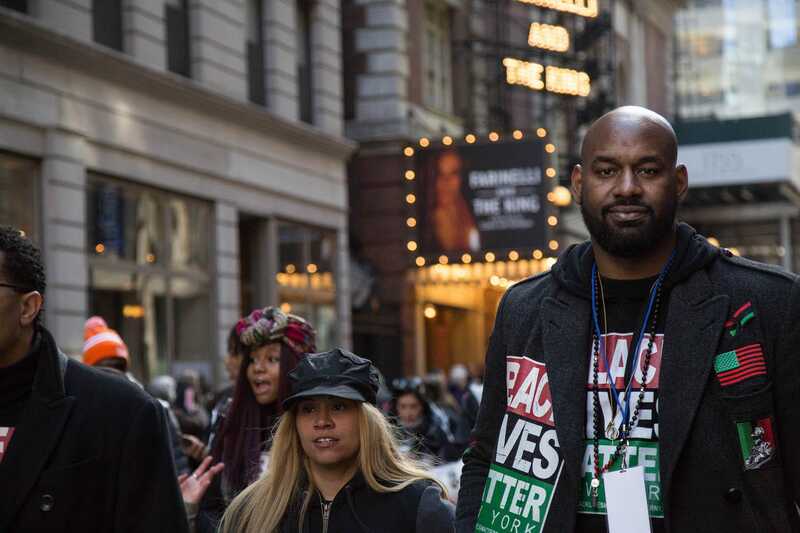 But also leading the way was the president of Black Lives Matter of Greater New York, 40-year-old Hawk Newsome. 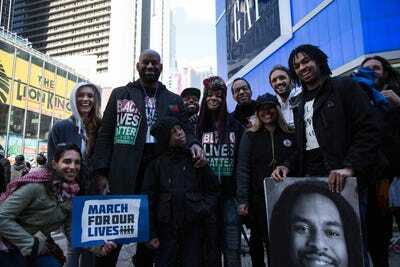 “It was important for us to be here in New York because when you have this national conversation around gun violence, people aren’t really talking about the people dying in Brooklyn, in the South Bronx or in the South Side of Chicago,” Newsome told Business Insider. 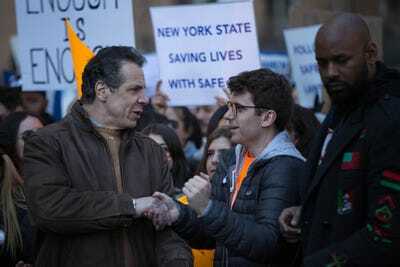 Newsome was seen marching next to Cuomo nearly the entire time. 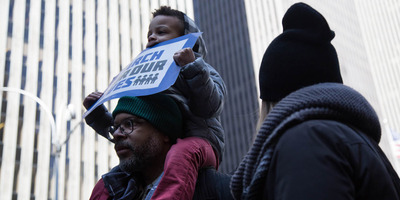 The protesters reached Times Square around 2 p.m., slowly filing out of the streets and filtering throughout the bright, flashing lights.